This publication is for anyone who has suffered or may suffer from eclampsia, and for doctors and midwives involved with their care. It explains the nature, origins and dangers of the condition, gives guidance on prevention and management and considers the risks of recurrence in future pregnancies. Eclampsia is a Greek word meaning ‘bolt from the blue’. It describes one or more convulsions occurring during or immediately after pregnancy as a complication of pre-eclampsia. Eclampsia has been recognised since ancient times, but it wasn’t until the mid-nineteenth century that doctors began to realise that the fits were normally preceded by a collection of circulatory disturbances now known as pre-eclampsia. Confusingly, however, very few cases of pre-eclampsia culminate in eclampsia, while eclampsia can sometimes precede pre-eclampsia. Eclampsia is rare, affecting about 400 women per year in the UK. Eclamptic convulsions look no different from epileptic fits. The mother is gripped by synchronised, repetitive, jerky and sometimes quite violent movements involving muscle groups in the eyes, jaw, neck and limbs. The spasms lead to temporary loss of consciousness, stop the mother from breathing, may make her bite her tongue and sometimes cause urinary incontinence. Most convulsions last for a minute or less before stopping spontaneously. If they are continuous, without a break, the woman is said to be status eclampticus, which is extremely dangerous. Before they suffer an eclamptic convulsion, most women have signs of pre-eclampsia, most notably high blood pressure and/or protein in the urine. Often there are one or more warning symptoms – such as restlessness, shakiness, intense headache, upper abdominal pain or visual disturbances – before the fit occurs, although these are very common, non-specific symptoms which are usually perfectly benign. For some sufferers, however, eclampsia is entirely unheralded, and signs of pre-eclampsia appear afterwards. Eclampsia can occur at any stage during the second half of pregnancy – and some rare cases have been reported before 20 weeks. At the other extreme, the fits can occur as late as during labour or after delivery; one case has been reported as late as three weeks after delivery, although this is highly unusual. According to a recent national survey (1), 44 per cent of sufferers experience their first fit after delivery – normally within 48 hours; 38% have it in the ante-natal period and 18 per cent during labour. Several factors are probably involved, including: reduced blood flow to the brain, caused by a combination of small clots and spasm of the small arteries; swelling in the brain (cerebral oedema), possibly as a complication of excessive fluid retention; bleeding from small arteries ruptured by the intensity of the blood pressure. Any woman with eclampsia is at risk of suffocation while the seizure is happening. Afterwards she may still be at risk, depending on the degree of brain damage that triggered the fit, and the severity of the underlying pre-eclampsia. Most women make a full recovery from eclampsia, but one in every 50 sufferers die and some are left with a permanent disability. Unborn babies whose mothers are affected by eclampsia are at risk of acute asphyxia (suffocation). About one in every 14 of these babies die. It is now known that eclampsia occurring antenatally – particularly pre-term – tends to be more severe for both mothers and babies than eclampsia occurring during labour or after delivery (1). Until recently it was assumed that conventional anticonvulsants, particularly diazepam and phenytoin, were the best agents for controlling eclampsia and preventing further convulsions. But a landmark multinational trial has now demonstrated that magnesium sulphate – the drug of choice in the US for many years – is better than either at preventing further convulsions, and may also save more lives (2). The drug is thought to work by improving blood flow to the brain, which suggests that impaired cerebral blood flow is the main cause of eclampsia. When these results were published in the summer of 1995, only 2-3 per cent of UK obstetricians were known to use magnesium sulphate, but this is likely to change in future. The drug is given by injection and is relatively straightforward to use. However, there is no suggestion that magnesium sulphate has any effect on the underlying pre-eclamptic disorder, and a woman who recovers from eclampsia may still be at risk from other complications of the condition. There is evidence to suggest that magnesium sulphate may prevent eclamptic convulsions in women with pre-eclampsia (3), but as yet it is not possible to identify those who would benefit most from treatment. In theory eclampsia can be prevented by vigilant antenatal care, including a well-timed delivery. But in practice fits which occur without warning may be impossible to prevent. In the US, magnesium is routinely given to women with pre-eclampsia in the expectation that it prevents progression to eclampsia. However, this regime is not currently standard practice in the UK (see above). Eclampsia most commonly affects women in their first pregnancies, with teenagers and women with multiple pregnancies at highest risk. However, about one quarter of cases occur in second or later pregnancies – in most cases to women with no previous history of either pre-eclampsia or eclampsia. WHAT HAPPENS IN THE NEXT PREGNANCY? Because eclampsia is so rare its recurrence rate is not known. About one sufferer in 20 will get pre-eclampsia in the next pregnancy, with the individual risk higher for those who suffered eclampsia relatively early in the pregnancy and lower for those who had a fit at or near term. Other than this, there is no way of predicting who is most likely to suffer a recurrence and no specific means of prevention, although treatment with low-dose aspirin may be recommended in cases where the problem arose before 32 weeks (4). For optimum safety, any woman who has suffered eclampsia in one pregnancy should be considered ‘at-risk’ in the next pregnancy. Former sufferers may like to consider preconception counselling with an expert to devise an appropriate antenatal care programme for the next pregnancy (5). The BEST (British Eclampsia Survey Team) survey analysed all cases of eclampsia occurring in the UK in 1992. British Medical Journal 1994; 309: 1395-1400. The Collaborative Eclampsia Trial compared effectiveness of magnesium sulphate against diazepam and phenytoin in more than 1600 women with eclampsia. Lancet 1995; 345: 1455-63. A US trial of 2,000 pregnant women with hypertension showed that those treated with magnesium sulphate were less likely to develop fits than those given phenytoin. N Engl J Med 1995; 333:201-5. Consult An Expert Via APEC: list of consultants who are considered expert in the management of all aspects of pre-eclampsia and are willing to accept referrals from GPs. 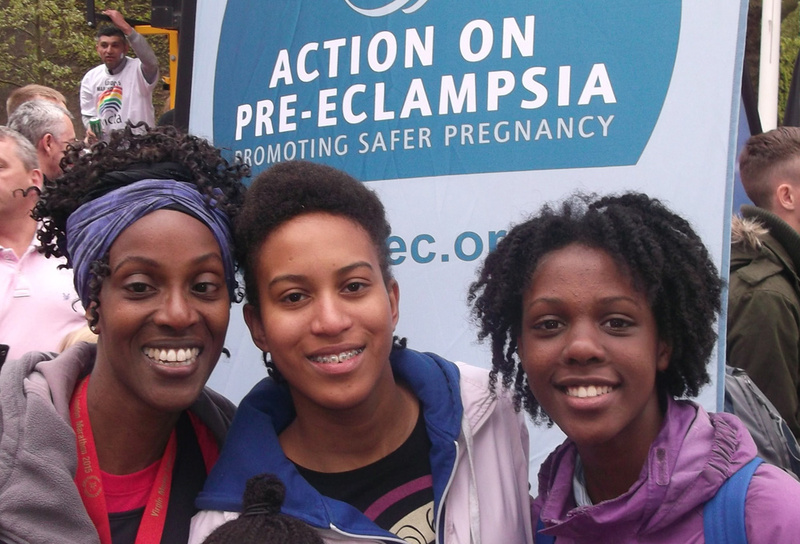 There are lots of other ways that you can support Action on Pre-eclampsia. You can become a member of APEC for as little as £3 a month, organise a sponsored event, or even run the London Marathon!